I’ve been doing a poor job on my plan to review a comic book per week, but I’ll try to make up for it, starting with the fun comic book Rocket Girl. 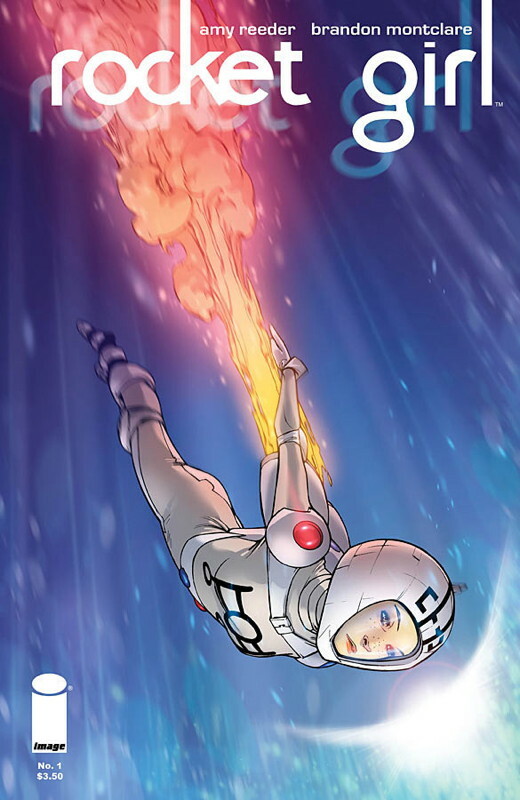 Rocket Girl was the subject of a successful Kickstarter over the summer, and is illustrated by Amy Reeder, perhaps best known for the Vertigo series Madame Xanadu, of which I enjoyed the art but felt it was let down by the story. (You can read a few of my comments on that series here.) I’m not familiar with writer Brandon Montclare, however. The premise of this ongoing series is that Dayoung Johansson (age 15) is a member of the New York Teen Police Department in the near future, and persuades her boss that Quintum Mechanics has managed to change the past so it becomes the dominant corporation. Dayoung – the title character – arrives just as Quintum is kicking off their first big experiment – and promptly passes out. Taken in by a few of the scientists, she has to maintain her equipment with ancient technology, and then responds to an emergency elsewhere in New York City where she captures a criminal, and then escapes the local cops. The kicker is that Dayoung comes from the year 2013, and has travelled back to the year 1986. And you may have noticed that there’s no Quintum Mechanics, New York Teen Police Department or Rocket Girl in our 2013. I like the premise, and the first issue is a lot of fun, driven mainly by Dayoung’s enthusiasm (and nifty costume). Reeder’s artwork is excellent – oh how I love when an artist can draw dynamic panels that have backgrounds! The story is a little shaky; I immediately wondered how Dayoung could show up and threaten to arrest the Quintum scientists, pass out, and not have them do something nefarious to her – like turn her over to the cops – never mind that she actually ends up staying with one of them in her apartment. It looks like the series is setting up a “hero and her team of supporting scientists” scenario, which feels cliche – especially since none of the supporting characters have much personality at this point – but could work out. And to balance out the plotting issues, the dialogue is solid and often witty. So it’s a bit of a mixed start, but I’m optimistic that the early bumps can be overcome, while still being a fun, energetic series. not really related to this topic, but Go Cardinals!